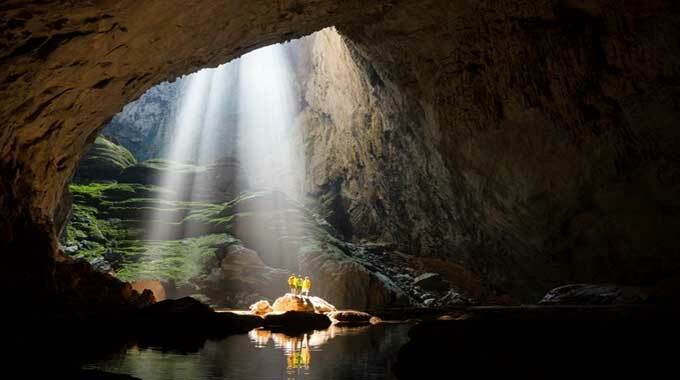 Son Doong Cave in the central province of Quang Binh recently overtook numerous world-renowned destinations to top the list of the 25 great places to see in the 21st century by the US magazine the Smithsonian. The magazine described Son Doong cave in Viet Nam’s Phong Nha-Ke Bang National Park as big enough to “accommodate the Washington Monument” and “fit a pair of Boeing 747s side by side”. “The cave is more than five miles long-about five times longer than its nearest competitor for the world’s longest, Deer Cave in Sarawak, Malaysia,” it wrote. “A shimmering blue river runs through it. Most spectacularly, a jungle flourishes under shafts of sunlight in stretches where the ceiling fell in long ago”. The Smithsonian list also includes Cern, the God particle laboratory in Switzerland, a space line in New Mexico, a gorilla national park in East Africa, the perfect place for watching stars in Chile and ice caves in Alaska. Son Doong Cave, which scientists believe was formed 2-5 million years ago, was first discovered by a local resident in 1991. In 2009, a group of British scientists from the British Cave Research Association prepared the cave for public access in a limited capacity, after extensively surveying the area. Son Doong is at least 6.5 kilometres long, 200 metres wide and 150 metres high. Its largest chamber is a whopping 250 metres tall.